You have to live within your means unless you are a bank, then you get someone else to pick up the tab. 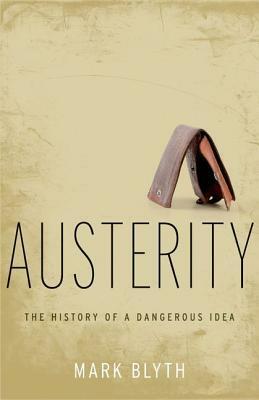 Austerity: The History of a Dangerous Idea is pretty much as the title implies. Mark Blyth lays out the history of austerity economics, the arguments for its use, and then counters those arguments. Job done: let’s have cake. In general, the deployment of austerity as economic policy has been as effective in bringing us peace, prosperity, and crucially, a sustained reduction of debt, as the Mongol Golden Horde was in furthering the development of Olympic dressage. I first became aware of Mark Blyth as one of a handful of experts who were explaining the European sovereign debt crisis and why countries like Greece were mad at the austerity measures. He and others were the only ones who managed to accurately cut through the econobabble and victim blaming. Before then, various people involved in causing the Global Financial Crisis seemed intent on pointing fingers at out-of-control government spending, or nation states who were riddled with debt and no major industry. This was, of course, a distraction. As an Aussie, I clearly remember during the Global Financial Crisis our treasurer dusting off his copy of Keynes and stopping us from being on the list of victims of the banks. As much as I quibble with some of the details of that economic stimulus, it worked. So it has puzzled me why so many financial experts seem to want to beat the economy to death in order to save it. This book offered the explanation. It was eye-opening and expanded upon tackling the concept of austerity for sovereign nations who were forcibly sidled with the debt of multinational banks. For such a highly supported and enacted policy you would have thought there would be some very solid economics underpinning it… Yeah, not so much. As Mark outlines, pretty much every case of its use is purely ideologically driven and has rarely worked. In fact, quite often it has been a disaster.